Being a successful indie author is not just about writing. You also have to run a small business … and that involves various tools and technologies. I was a business consultant for 13 years across Europe and Asia Pacific, working for large companies like Accenture (then Andersen Consulting), Cap Gemini/CGEY and even IBM for a short stint, as well as small boutique consultancies. One of the first things we would do as a team entering a new business was to do a technical architecture map, in order to understand the current state of the business before we made any changes. I realized the other day that I have almost lost track of all the moving parts in my own business, so I decided to do a technical architecture map of all the software (and some hardware) that I use to run The Creative Penn Limited, which is now a multi-six-figure company. Yes, I run a global media company from my laptop … but it's almost entirely dependent on the internet to run. Come the zombie apocalypse, it won't be worth much, but until then, it should continue to grow and scale because the tools we have access to now are incredible. Here's the overview picture and then I explain all the various parts below. I have grown into them over time, and they are not necessary for everyone. There are also plenty of other options that serve the same purpose. Different people prefer different tools, and you also need different things as your business grows. NB. I've used affiliate links where appropriate, which means that if you do buy anything, I get a small % of the sale, although it won't affect the price you pay. I only recommend things I use myself or know the people involved personally. MacBook Pro. I shifted to Mac after writing for 2 years and deciding I wanted to switch my corporate PC head into something more creative. Once you try Mac, you never go back … true for me! Scrivener. For writing all my books, as well as formatting ebook files for Kindle and ePub formats. I don't know how I ever wrote a book without Scrivener. It is life-changing for writers! All for just $45. Amazing. Try it here for Mac and here for Windows. And now for iPhone and iPad as well! Dragon Dictate. Like many indies, I've been trying to use dictation to ease RSI and write while walking or standing, plus increasing my word count on first draft. I used it for my last novel, Destroyer of Worlds, and was impressed by how good the speech to text is these days. Click here for an interview with Monica Leonelle about how to dictate your book. Kindle Paperwhite. I read on my Paperwhite in bed and when relaxing on the couch, and on my iPhone when I am out and about. I usually have over one hundred samples on the device and five or six books on the go at any one time, plus I ‘own' over 1500 books on the device. As much as I love Kobo, and I'm a Mac user so I also like iBooks, Amazon ‘recruited' me as a customer when they were the first to introduce an e-reader into Australia in 2009. Here's an amusing video and review when I first switched. New print books were around AU$30, which works out at about 5x as expensive as the UK, so I was champing at the bit to go digital! Amazon KDP, Kobo Writing Life, iTunes Producer and iTunes Connect. For self-publishing ebooks. Here's my recommendations on how to self-publish ebooks. Draft2Digital. For self-publishing ebooks to multiple platforms through one distributor. I use D2D for Nook now, as well as smaller platforms like 24Symbols and Scribd. Here's an interview with Dan Wood from D2D with more details. Createspace. For self-publishing print books. Click here for more on self-publishing print. ACX. For self-publishing audiobooks. Click here for lots more details about your audiobook options. Amazon Author Central. For creating your Amazon Author pages and updating details about your book. I maintain separate pages for Joanna Penn (non-fiction) and J.F.Penn (fiction). There are country-specific sites. BookLinker. Enables you to create one link for all Amazon stores that auto-redirects people and you can use your store specific Amazon affiliate links in it as well. BookFunnel. For giving away free books to people who sign up to my mailing list and to provide ARCs to early readers. Listen to this interview with Damon who runs BookFunnel for more info. TrackerBox. For tracking book sales volume. There are a number of other options for this but I need (a) multi-platform and not just Amazon specific and (b) I'm not willing to put my passwords online so it has to be offline software. This is only available for the PC so I bought a small, cheap PC to run it on. I would LOVE some kind of decent Mac solution for this. Here's my 2015-2016 book sales figures breakdown. Facebook. I have 2 pages that relate to my 2 brands: Facebook.com/TheCreativePenn (for authors) and Facebook.com/JFPennAuthor (for readers). I'm on FB every day now and use it for reaching and connecting with customers, participating in author groups as well as running my own premium members-only FB group for my Creative Freedom Course, and using it for advertising. Twitter. I have one profile @thecreativepenn and primarily use it to connect with peers and authors, as well as sharing content. I have a list of people I regularly check on twitter and often find books through recommendations there. I'm on Twitter most days and it's my favorite social network for connecting with people. Pinterest. I have one active profile Pinterest.com/JFPenn and I use it for fiction research and imagery that goes into my books. Flickr. I have one profile for Joanna Penn and use the site to share Creative Commons Attribution Non-Commercial photos. This means you can use my photos on your blog or for non-commercial use as long as you attribute me as the source. I do have an Instagram account (JFPennAuthor) but I rarely use it. YouTube. I have one channel YouTube.com/thecreativepenn where I share video interviews (that also become podcasts) as well as other videos I record about writing, self-publishing, book marketing and creative entrepreneurship. Goodreads. I have one profile which I mainly use to add my own books, run giveaways and also log my own reading so I don't forget the excellent books I've read this year. I always do a Christmas Day book recommendation post so I use Goodreads to look back in Dec.
Google Plus. I still maintain a G+ account even though I rarely use it now. LinkedIn. I still maintain LinkedIn even though I rarely even check it now. It is a vestige of my former corporate life! Feedly. Used to collate the blogs I read into one feed which I check on my iPhone. Integrates with Buffer. BufferApp. Used to schedule fresh content into my Twitter stream, primarily from Feedly. These are tweets I will generally only share once as they are news pieces. I will schedule my own blog posts in 3 time zones over multiple days. MeetEdgar. Used to schedule evergreen content into my Twitter stream, primarily from my own site. This is because I have over a thousand useful articles, audios and videos as well as books and needed a way to keep sharing the ‘backlist' without having to remember to do it on Buffer. Social Media Warfare Plugin for WordPress. This is a great (premium) plugin for controlling the images that are associated with your posts and enabling easier social sharing. More on this and other social media tips for writers in this interview with Frances Caballo. WPEngine. Premium hosting service that I moved to when this site got so big that I needed much more dedicated service, but that was after 7 years on cheaper services. I recommend Bluehost for authors who don't have a massive site like this, and you can watch my video tutorial on how to setup your own website in under 30 minutes here. I use Bluehost for my Dad's website, ArthurJPenn.com. Remember, you can always change hosting companies. WordPress.org software + various plugins. When I started this site back in Dec 2008, I couldn't have possibly foreseen where I am today in terms of being a full-time author entrepreneur with 20 books as well as courses, audio and multiple streams of income that support both me and my husband full-time. The amazing thing about WordPress software is that you can use it for a brand new site with no traffic and barely any content (see my first post in Dec 2008) and the underlying software can still be used for a site with thousands of unique visitors per day and a whole lotta content. You don't have to have any tech skill to install it either – check out the video tutorial here. Studiopress themes. Themes are like the skin for your website. You can change the look and feel without impacting the content. I'm currently using Beautiful Pro for this site, and Author Pro for JFPenn.com, both premium themes from Studiopress. They are responsive themes which means you can view them on mobile and they still look good. This is critical as Google penalizes sites that are not mobile responsive these days. GoDaddy. For buying domain names and domain management e.g. www.TheCreativePenn.com. The first time I bought a domain, I didn't have a clue what I was doing and bought one from a local hosting company for 10x the price I could have bought it on Godaddy, but then I switched everything over later. Their interface can be messy and they try to upsell on everything, but I've been using them for years and the price is excellent. BigStockPhoto. For images to use as shareables with blog posts. Images make it much more likely that people will engage, click and read posts so it's important to use them. I use a lot of my own pics as well as some Creative Commons but also find having a paid subscription for premium images useful. Canva. For creating images for social media, blog posts, advertising and more. A fantastic free service if you just use your own images, or you can pay a tiny amount to use their images. This is super useful as it has templates for things like Facebook headers, Twitter posts, even Kindle book covers as well as enabling custom pixel sizes. One of those tools I'd struggle to go without now. ATR2100 microphone. For recording high quality audio. I've tried the Snowball and the RODE podcaster, but this is my favorite. I also use it for recording my own audiobooks (in my cupboard!) and also for podcasting when I wear my iPhone headset to keep the audio clean. eCamm Recorder. For recording audio and video interviews. Incredible price for what this is. Screenflow. For video editing. I've used Screenflow for years to do my interview video edits as well as creation of my online courses, plus other videos I do. My husband is now doing the video interview edits and he prefers using Final Cut Pro. You can use Camtasia for PC. Amadeus Pro. For audio editing, although you can use a free service like Audacity. I use it for editing podcasts and also the audiobooks I record myself. Auphonic. For leveling the sound and adding metadata. I create the podcast file in .aiff format and then use auphonic to create the final mp3 for a more professional finish. Amazon S3. For hosting the audio files. Blubrry Powerpress plugin. For distribution of the audio files to iTunes and Stitcher, as well as formatting and playing on the blog. It's a fantastic service and plugin, with hosting available if you want an all-in-one service. Speechpad. For transcription of audio. Recommended by Chris Ducker in this podcast on outsourcing and virtual assistants. My VA, Alexandra, formats the transcription every week which is super useful. 1Password. For managing logins to all these sites, plus sharing the logins between me and my husband as he now works in the company. QuickBooks. For book-keeping and accounting. Imports transactions from my bank so I can code to the various accounts and report easily. I can also give my accountant a logon and put all the ‘paperwork' in dropbox so it is all managed remotely. PayPal. Essential for running a global business with income and expenses in USD and other currencies. Get this set up as soon as you can for your business as the various anti-money-laundering checks can take time before they raise the bar on how much money can flow through the account. Online banking. For managing bank accounts, payments etc. I have accounts in GBP and also USD, as well as a separate account for accruing for tax and other expenses. Amazon S3. For hosting media files for the podcast and also for backing everything up. Super cheap hosting and I've been using it with no issues since 2009. Gmail for Business. I used email as part of my web hosting for a long time but was advised that redundancy is better, as if they are connected and your site goes down, your email is also down. Google For Business email is great and very cheap. Asana. For managing tasks in a team, requested by my husband when he joined the company so I wasn't randomly emailing him tasks all the time! Google Drive. For collaboration. I used folders and documents to co-write Risen Gods with J. Thorn and use shared spreadsheets in Google drive for working with translators and my VA. I also use Google Forms whenever I do a giveaway or do a survey. Physical Filofax diary. I'm still old school when it comes to scheduling. There's just something about being able to flick forward months ahead and scribble by hand. Things app on iPhone. There are lots of apps for lists but this is my favorite and I use it every day. I have a running To Do list with dates on but also a folder for Fiction Ideas where I keep notes and thoughts. It syncs to my MacBookPro which I like. Moo.com: For physical business cards and postcards. Fast, good quality stock. Teachable. For hosting and selling my online courses, Self-Publishing Success and Creative Freedom. I used to sell from my own site directly but I love Teachable as it has great hosting and up-time and much smoother payments and ease of technical use. No plugins to maintain! Selz. For hosting and selling my own ebooks and audiobooks direct from this site. Click here for an evaluation of direct sale options and also how I'm handling EU VAT for digital sales. Unbounce. For creation and split testing of landing pages. This is something my husband is getting into as he was a statistician and data geek in his previous day job. I'm leaving this with him to handle! Active Campaign. For email marketing. I used Aweber for many years and still recommend it for authors starting out, but my business has a lot of moving parts and we decided to move to AC for the extra segmentation ability. I still recommend authors use Aweber or MailChimp. Zapier. For connectivity between web applications. For example, if you use Facebook Lead Gen ads, you have to manually download a file and upload it into your email provider – unless you use Zapier or something like it, which removes the manual step. Stripe. For some online payments and receipts. EventBrite. For ticket sales to physical events. When I run live events, I use EventBrite to handle ticket sales, for example, How to Make a Living (and a Life) with Your Writing in London, Nov 2016. To be honest, I was a little surprised at how many services I use. But in revisiting them all, there aren't any I would get rid of. They all serve their purpose. I've also added them over time as needed, and changed them as things have changed or new tools have come along. Just to reiterate, it is very unlikely that you need all this right now! Many of these tools are free, some have one-off payments and others have a nominal monthly cost. I just checked my accounts and for the tax year May 2015 – April 2016, I spent 4% of my total income on Internet Costs. That's pretty amazing because this is my business infrastructure. I don't have a storefront or overheads around a physical enterprise. These internet costs are the backbone of my business and they are comparatively cheap. We live in incredible times! OK, you can find lots more detail on how I run my business in Business for Authors: How to be an Author Entrepreneur, available in ebook, print and audiobook (narrated by me!). I'd love to hear about what tools you use right now, so please leave a comment or question below and join the conversation. If you want to be a successful indie author these days, you need to get to grips with technology. Whether it's writing, publishing or book marketing, there are lots of different tools that can make the author life easier … if you're willing to learn. In the intro, I mention the new Audible snippets functionality, How I Have Iterated And Optimized My Author Business In The Last Year, and the new Self-Publishing Formula Podcast. Plus, my progress on Destroyer of Worlds, ARKANE #8. This podcast is sponsored by the Creative Freedom Course; A Step By Step Guide to Making a Living with Your Writing, based on my own journey from one book to multi-six-figure author entrepreneur. Creative Freedom is about empowering you as the creative and giving you the tools and skills necessary to make a living with your writing. Click here to learn more. Ron Vitale is a fantasy and sci-fi author, as well as a web technology director in higher education and a marathon runner. Here's his round-up post on lessons learned as an author in 2015 which we talk about in the show. What Google Analytics is and why it matters for authors. Writing blog and website content aimed at the specific audience Google Analytics is telling you is visiting your site. The next steps after Google Analytics, including enabling demographic aspects and asking readers what type of information they want more of. Google Tag Manager and its uses for authors. Why measuring information helps us to manage it and these Google tools help authors create more diversified streams of income. A brief overview about Search Engine Optimization (SEO) and the future of web searches, including how algorithms are learning from what we search for. Why longevity matters to Google. The future for writers who want to create in new arenas like Virtual Reality and Augmented Reality. An explanation of Accelerated Mobile Pages, how authors can apply this technology to their sites and why it matters for global growth of ebook sales. Read The Next Web article on AMP, and also this article about WordPress plugin for AMP. On work-life balance and not being able to do everything at once. Lessons from marathon running that can be applied to the writing life. You can find Ron at www.ronvitale.com and on twitter @ronvitale. How does your site look on a smartphone? 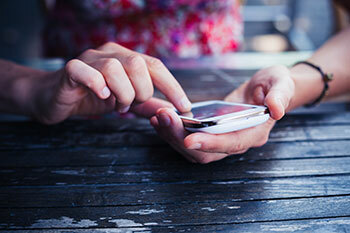 Nearly half of all website visitors are using†mobile devices. On a recent post about author websites, I mentioned the importance of a mobile responsive theme. It's now even more critical to get this sorted for your author website as Google have made changes to their algorithms to favor mobile-friendly sites. I've also written in the last few weeks about the rebranding and retitling of my first 3 novels. As part of that change, I've rebuilt my fiction site, JFPenn.com with a new theme. So essentially, I've been immersed in website fun for a while now! As I get so many questions about this from other authors, I've asked Sara Whitford, an author and website designer, to go into more detail. Hopefully, this will help with your website redesign or optimization, something we all do as part of the author journey. 1) Why do authors need a mobile responsive website? Get them to sign up for our mailing lists so that we can communicate with them directly when we have something to offer that we think might interest them. That said, a huge amount of Internet browsing is done on mobile devices. Joanna has told me roughly 43% of JFPenn.com traffic (the site for her thriller novels) is viewing the site on a mobile browser. I am seeing similar figures – averaging about 40% of traffic to my own sites – is viewing on mobile devices or small tablets. Createspace is a great, easy-to-use siteóas long as youíre on a computer screenóbut itís a challenge to navigate if youíre on a mobile phone. What kind of browsing experience do you think someone will have if they go to your website and it is not mobile responsive? They'll not likely stay for long. It's not much fun, and it's quite frustrating, trying to navigate a site by pinch-stretching the screen every time you want to click on a link, or read or enter a bit of text. And now, Google is doing its part to make sure the mobile web experience is as user-friendly as it can be, and if your site isn't up to their new standards, its search engine rankings will likely tank. Recently, Google enacted new search algorithms that prioritize mobile-friendly sites in search results. This change effectively penalizes sites that are not mobile-friendly by not ranking them as high as their responsive counterparts. While a lot of other variables go into website SEO, making sure your site is mobile responsive should be at the top of your list. I published an article on my author blog ahead of Google's algorithm change that explains what a mobile responsive website is, as well as some easy steps you can take right now to make your site responsive. 2) What are the top 3 issues that you see on author websites? In no particular order, I'd say my top three issues with author websites are that they either don't look professional enough, they don't have fresh content, and they often aren't responsive, or mobile-friendly. 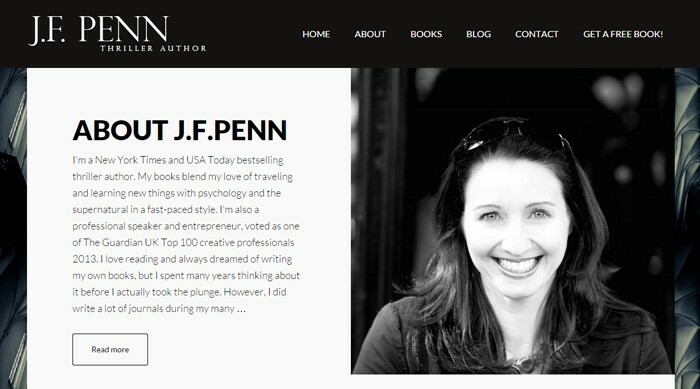 Joanna Penn's fiction website (jfpenn.com) is a professional-looking, mobile-friendly site. You need a professional-looking website. It doesn't have to cost an arm and a leg to get a decent looking website. If you're willing to do the work, you can learn to put something that looks quite professional together for yourself. I'm always teaching myself new things when it comes to website development and you can too!†Nevertheless, even if you decide your time is better spent elsewhere, go ahead and set a little bit of money aside and hire someone to help you set up a site that you can maintain yourself. Your website might be the first place a potential reader comes into contact with you before ever even reading one of your books. You just don't want it to look amateurish. You need fresh content. Give readers a reason to keep coming back. If your site is nothing but a billboard advertising your current books, they'll (maybe) spend a few minutes looking to see what all is there, but that'll be the end of it. Ideally, you'll have a subscription form of some sort for your e-mail list. Joanna has some great information about that right here. While you write fresh content, try to keep it timeless. That way, you can employ a fantastic auto-sharing plugin like Revive Old Post, which will automatically (and randomly) share your content on the social media networks of your choosing based on a schedule you set up. You need a mobile-friendly site. See number 1. Here's some advice on how to make your site mobile-friendly. 3) What are some of the other key aspects an author needs on their website? Are you using social media? You should be. You don't have to answer every tweet or Facebook post, but you should at least give readers a means of connecting with you on at least two or three social media sites. If I had to pick just three, I'd choose Goodreads (because of all the readers! ), Twitter (because it's fun), and Facebook (because you likely already have a built in network there and it's so easy to share new blog posts, book news, and so forth). I have a longer article about Social Media for Writers. You want readers to be able to easily share content from your site, so make sure you are using social media share buttons on each post. In addition to making sure that your site has fresh content regularly (whether it's weekly or monthly, whatever you can manage), you should also have share buttons at the bottom of any articles so that people can post them easily to their social networks. Don't worry about grabbing share buttons from all of the social media sites. There are plenty of plugins that can help you accomplish the same thing. Please don't decorate your site with clip-art from your word processing software. I mean, the occasional cutesy image is ok, but otherwise, try to keep it professional. Don't worry if you don't have Photoshop or Illustrator. Two great tools that can help your site look its best are Canva and Dollar Photo Club. Canva.com is a site that will let you create professional quality graphics in sizes specific to different social media (such as those perfect Twitter banners, Facebook covers, etc.) or in whatever dimensions you need. You can upload your own images to incorporate (such as a book cover or your photo), plus they have a variety of free elements you can use to build your graphics, or you can purchase premium elements for a dollar a piece. DollarPhotoClub.com is a massive high-res stock images library where you can find the perfect graphics for any project for only a dollar each. 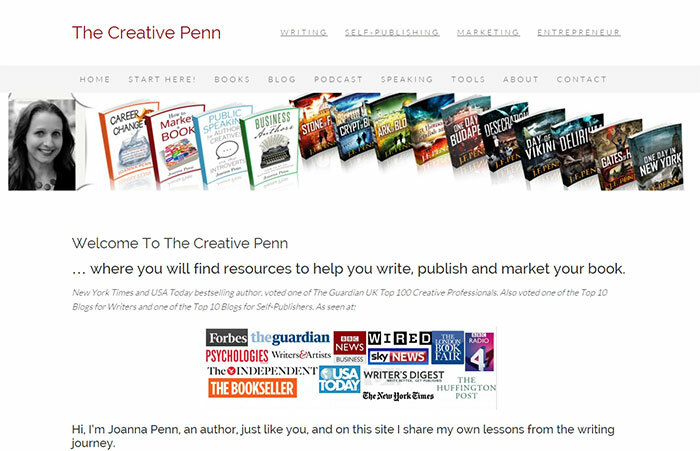 TheCreativePenn.com website highlights Joanna's expertise and has a tone reflective of her non-fiction books. It's very different than her fiction book website as seen above. 4) Many authors are confused about branding and colors for websites – what do you recommend in terms of branding? Most authors will want to focus on developing a site that accurately reflects the tone of the books they write – that is, if they stick to one genre. For instance, someone who writes serious military thrillers probably doesn't want a website full of cheerful pictures of kittens and rainbows. Take a look at your book covers and try to find common elements such as colors, fonts, and related imagery. When a reader visits your site, you want to draw them into the world of your novels and other content that is relevant in some way. Occasionally, authors will write in two or more wildly different genres. When they do, they might want to consider setting up more than one site – like Joanna has done with thecreativepenn.com and jfpenn.com. The former, she uses for her non-fiction writing books and related blog. The latter is for her thrillers. In my case, while I don't have plans to write many non-fiction books like Joanna, I still enjoy blogging about the tips, tricks, and hacks I'm learning as an independent author-publisher and giving back to the indie community by sharing those with my fellow writers online. Still, I realize the readers of my Adam Fletcher Adventure Series probably don't care much about how I use Scrivener or that I'm a fan of plotting my novels on index cards. For that reason, I have two websites: one is my author site, the other is for my book series. 5) What do you recommend if people want to do it themselves? In short, I recommend is a site built with the WordPress platform and using the Genesis framework by Studiopress, along with one of their brilliant child themes. Right out of the box, all of their themes are mobile-friendly and they make SEO easy. 6) What do you offer if people need help? I'm always happy to answer questions via my website if I am able, but I also hire out my services to help create high quality, professional-looking websites at affordable prices. I'm a newly published author, so I'm still dependent on my day job designing websites to pay the bills. I've been building websites for nearly two decades with all varieties of technologies, but for the last five years, I've become a huge fan of helping people build WordPress sites using Studiopress themes. I'm also experienced at integrating social media, setting up podcasts, content planning, SEO, and much more. My hourly rates are competitive and no job is too big or too small. If you're interested in finding out what it might cost to develop or just upgrade, your own website, you can contact me via the form on this page. Sara Whitford is a writer, historical researcher, editor, website developer and homeschooling mom of one very cool boy.